A $50-million gift from two generous UCLA alumni led to the renaming of the UCLA Meyer and Renee Luskin School of Public Affairs in 2011. Meyer Luskin, a Los Angeles business leader, and his wife Renee donated a total of $100 million to also fund the Luskin Conference Center, a hotel and meeting venue on campus. Your support makes it possible for Luskin students to gain a lifelong professional network of peers and mentors who shape their career paths while they reshape the world. Many of our students aspire to professional lives – at home and abroad – in which they will work to improve quality of life and access to services and resources. Philanthropy helps students further their education and their reach by attending professional conferences, sharing broadly, and gaining valuable experience in high-level fellowships and internships. In addition, when you support UCLA Luskin faculty through research funding and named faculty chairs, you help bring the most highly regarded and sought-after educators to the school to engage in work and research and to inspire and train our students. What they achieve together is called progress, and it helps people everywhere. 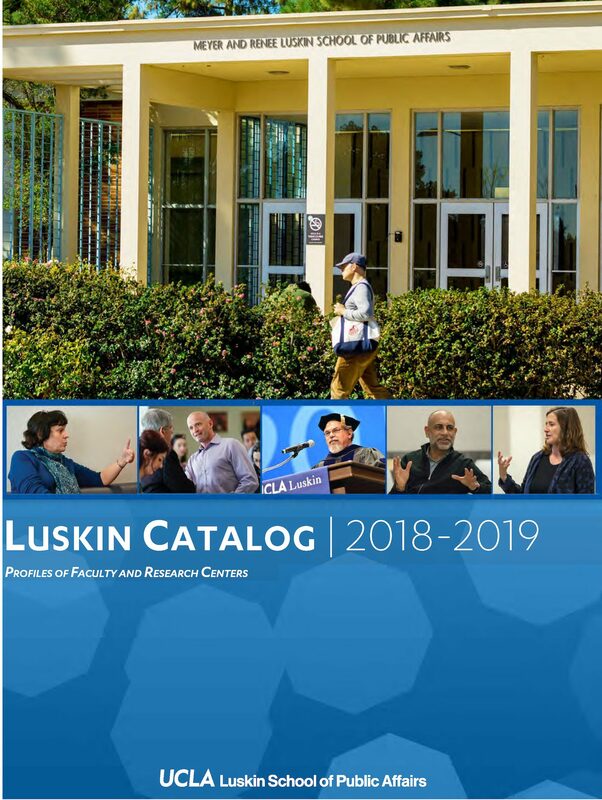 View the 2018-2019 UCLA Luskin Catalog, which spotlights initiatives by the School’s faculty and research centers — critical study areas in which donor support can be particularly impactful. You may choose from a number of options for making your gift. Learn more about ways to make a donation that works best for you. Phone: If you want to speak directly with us about what you would like to accomplish with your philanthropy to UCLA Luskin, you can reach us at 310-206-5479. Appreciated Stock: UCLA Luskin welcomes gifts of appreciated stock. You can download the appreciated stock giving form here. If you have questions, please call 310-794-3333. All gifts to the UCLA School of Public Affairs are fully tax-deductible for federal income tax purposes, and subject to any limitations placed on charitable gifts. Go here for other fund disclosures and information on donor privacy. For UCLA tax I.D. numbers, tax exemption letters, and other frequently requested documents, please visit the UCLA Donor Toolkit. Bequests and Planned Gifts: Legacy gifts have resulted in some of the School’s most generous and far-reaching gifts. Your planned gift will ensure academic excellence and access for generations to come. Your gift can also provide financial and tax benefits for you, your heirs, and others you care about. Many individuals who could not otherwise make a major gift find they are able to do so with a carefully planned gift, thereby fulfilling their philanthropic goals for the School. Whatever your age, you can make a substantial contribution to the UCLA School of Public Affairs through a planned gift and satisfy your personal tax and longterm financial goals at the same time. Learn More: UCLA has extensive planned giving resources, dedicated staff, and in-house attorneys available to answer your questions, on a confidential basis and without charge or obligation. To learn more you are welcome to contact the university Planned Giving Office directly.